BFGSF has teamed up with Together We Can, Inc. (TWC), a 501(c)3 nonprofit organization dedicated to partnering with “groups committed to making significant and meaningful changes in their communities, both locally and internationally.” TWC’s mission is “to provide opportunities and assistance for people in need to empower them to transform their lives” by coordinating resources to areas of identified need. Through our partnership with TWC, all donations to BFGSF are now tax-deductible. With no administrative fees, 100% of your generous donation goes to BFGSF. 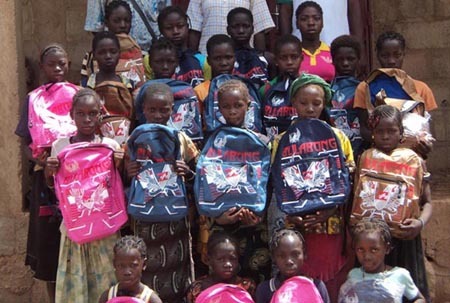 To donate to BFGSF through PayPal or credit/debit card, go to TWC and select Burkina Faso Girls’ Scholarship Fund. Please indicate your mailing address if you’d like to receive a receipt for tax deductions. For EIN (Employee Identification Number) or other information, please email TWC. *Note: For purchases of Shea4She shea butter, please send all sales to BurkinaGirlsSF@gmail.com, NOT to TWC. Thanks! Thank you so much for generously supporting girls’ education! We have whipped shea butter from a women’s co-op in Burkina Faso, Africa into a vitamin-rich, natural skin cream for you! All proceeds go to support girls’ education with BFGSF. 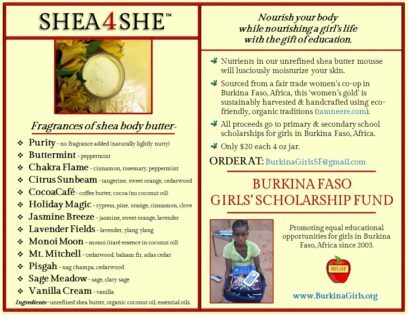 Become an advocate for girls’ education- order your Shea4She mousse by emailing your selection to BurkinaGirlsSF@gmail.com. Shea4She can be purchased through PayPal (to BurkinaGirlsSF@gmail.com). 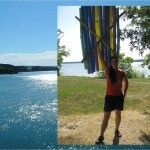 Our article in the FBF newsletter gives an update on the BFGSF girls (pg 9)! Thank you to the Friends of Burkina Faso for their support and for the opportunity to share our latest news in their publication! 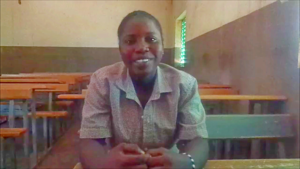 A photo of Judith, the BFGSF high school scholar whom we interviewed for the article, is pictured below. BFGSF made the national Burkina Faso daily newspaper, Le Pays! The article highlights the scholars as they start the 2016-2017 school year. 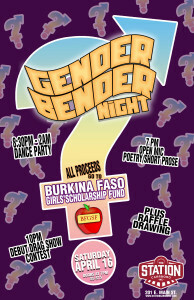 There are 35 BFGSF scholarship recipients this year, which is double last year’s number, thanks to a generous grant from the Friends of Burkina Faso (FBF) and donations raised from the Gender Bender fundraiser in April. Thanks to FBF and all donors for your support! BFGSF is pleased to announce our upcoming fundraiser at The Station in Carrboro, NC, Saturday, April 16! This event will explore our concepts of gender and gender roles, expanding our awareness to how females and males are perceived differently around the world. We seek to cultivate our world to value and enable individuals to be themselves and reach their potentials, free from any restrictions based on gender. 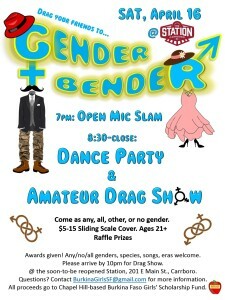 Drag yourself, Drag your friends for an all night Gender Bender! Let your expresion be un’tied’ to gender; ‘skirt’ gender norms. Wear what ‘suits’ you, and ‘make-up’ yourself as any/all/no gender! Say YES to the dress! Gender play/blurring is encouraged but not required. Grant award and more news! 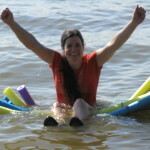 Grant: BFGSF is pleased to announce we have won a grant from Friends of Burkina Faso! This support enables the purchase of bikes for students this school year, along with resources for bike maintenance and repair. 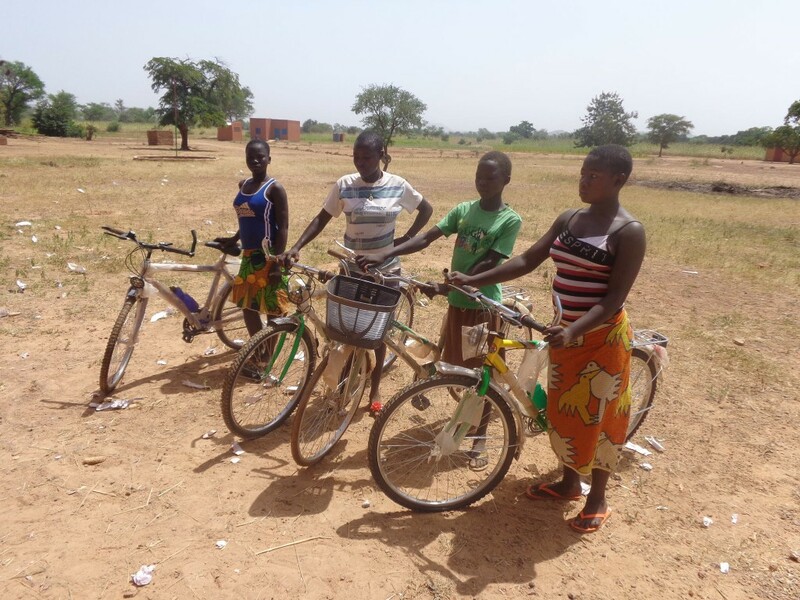 Bicycles are the bridge to education for girls who may live in rural areas far from school. With household chores, girls cannot spend hours walking 12 miles each way to school. Bikes equal access to education. Twitter: We’re now on Twitter! Connect with us @_BFGSF ! Peace Corps Partnership: We’re happy to announce a new collaboration with the Peace Corps in Burkina Faso! Peace Corps volunteers will be third party stewards to work with our program on the ground! We are thrilled with this new positive and productive way to promote girls’ education. I’d like to urge friends not only to toast those who are actively involved in promoting education, but to help create educational opportunities for girls in Burkina Faso. Providing financial support on behalf of one or both of FBF-sponsored scholarship programs is an excellent way to enable young women to gain an education! Studies show that women who are educated gain control over their lives–benefiting not only themselves, but their families and their communities at large. Our partner, recently affiliated with FBF Projects is the Burkina Faso Girls Scholarship Fund (a.k.a. BFGSF). This program was developed in collaboration with Hermann Yelkouny, the Director of Help for the Future, a Burkinbè NGO. (Note, one co-founder served as a Peace Corps volunteer in Titao, Burkina Faso in 1999-2002). The primary focus of BFGSF is to offer need-based scholarships to girls living in the rural areas of Gonsin, enabling them to advance their education in neighboring Yako where there is a secondary school. Keep in mind: when a girl in Burkina Faso receives an education, she marries later, has fewer children, earns more income, and is better able to invest in her children’s health and education. An educated woman gains control of her own life. She also is better able to contribute to the development of villages in Burkina Faso and the nation as a whole. Importantly, education empowers the next generation to reach its potential.